Who said Halloween is just for the children? 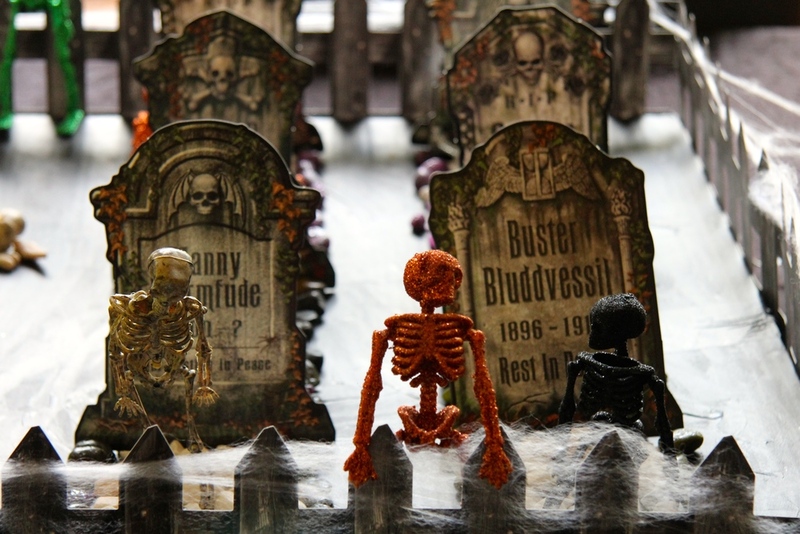 This Halloween Graveyard was definitely created with the adults in mind. 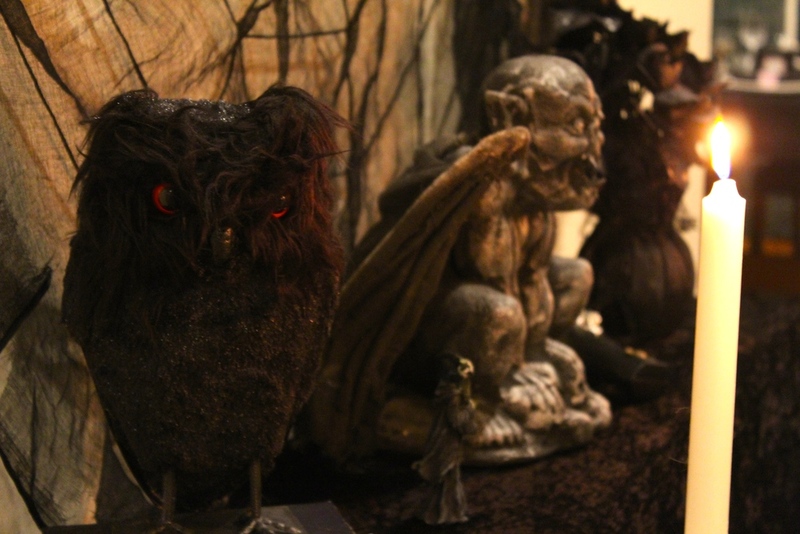 It was a dark and eerie scene, perfect for a late evening post trick and treating party. 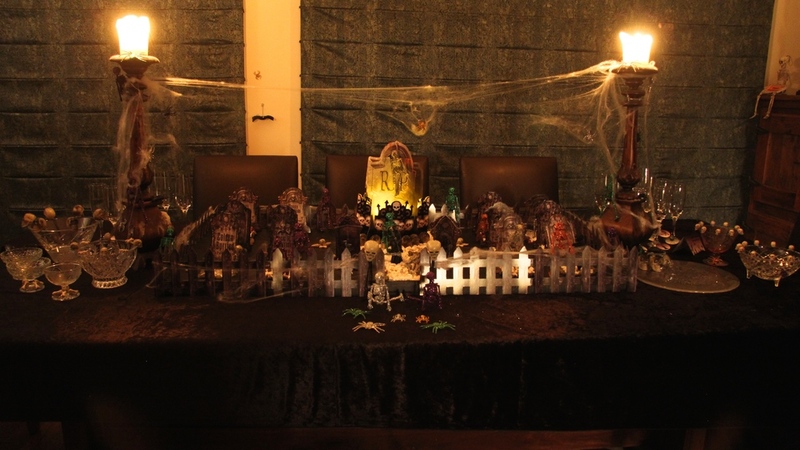 For this party I transformed my Dining table into a miniature graveyard including well defined graves and tombstones, skeletons raising from the graves and lots of bones. 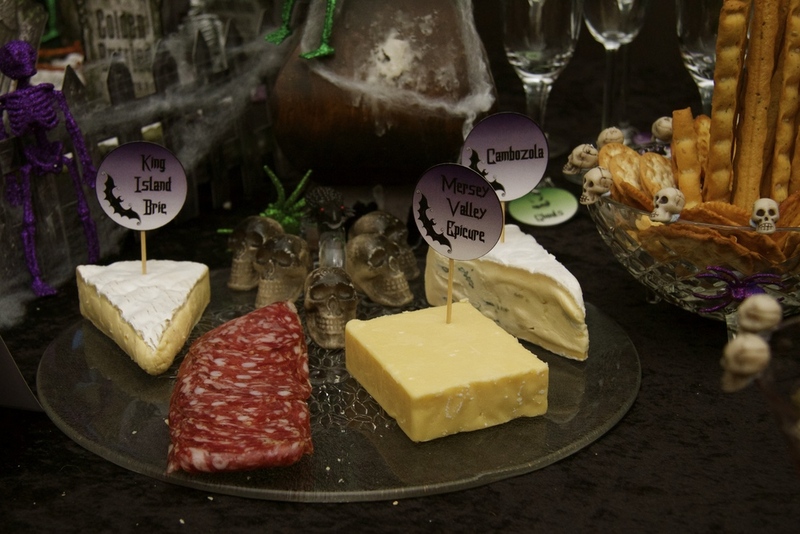 As it was later in the evening it was a Champagne and Cheese affair served on crystal dishes which had been embellished with bones and skulls. I've created a tutorial for the graveyard which will be posted shortly. I'm also offering the Halloween Printables used in this Party as a free download. I'd love to see how you have used them for your Halloween Party. If you want to create something a bit different this Halloween, the Graveyard worked wonderfully. 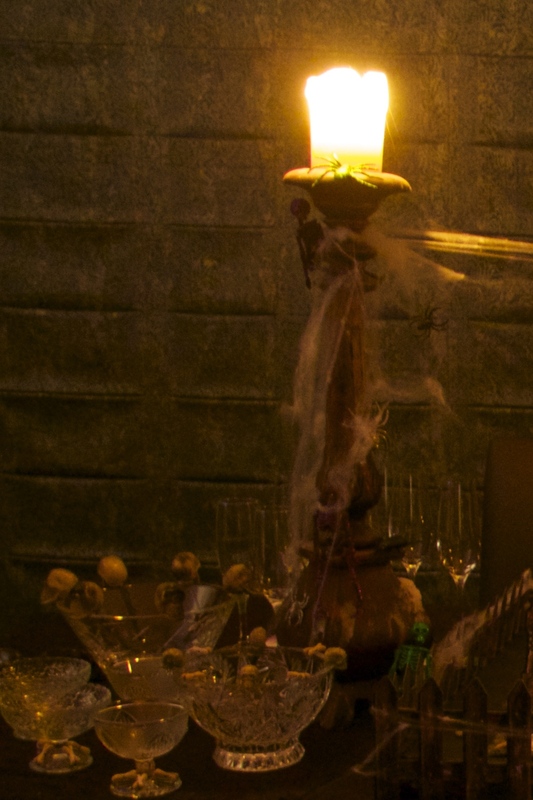 The actual graveyard was just over half the length and width of the table, allowing space for Champagne glasses and serving plates. 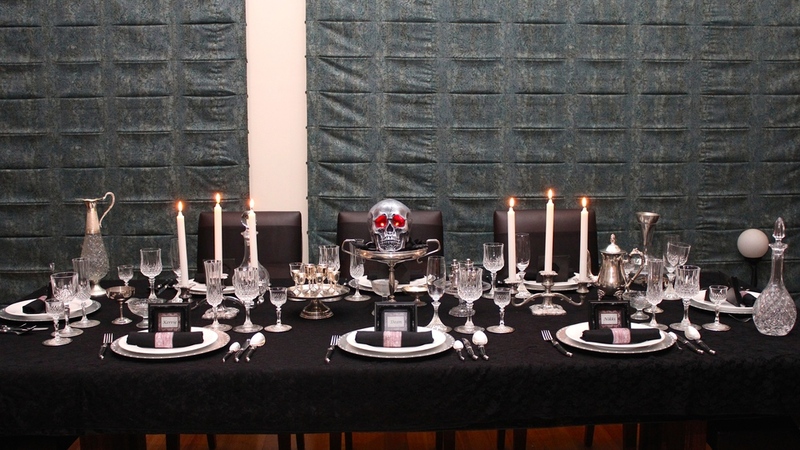 I used black crushed Velvet as a table cloth and a pair of tall vintage candle sticks gave height to the table. 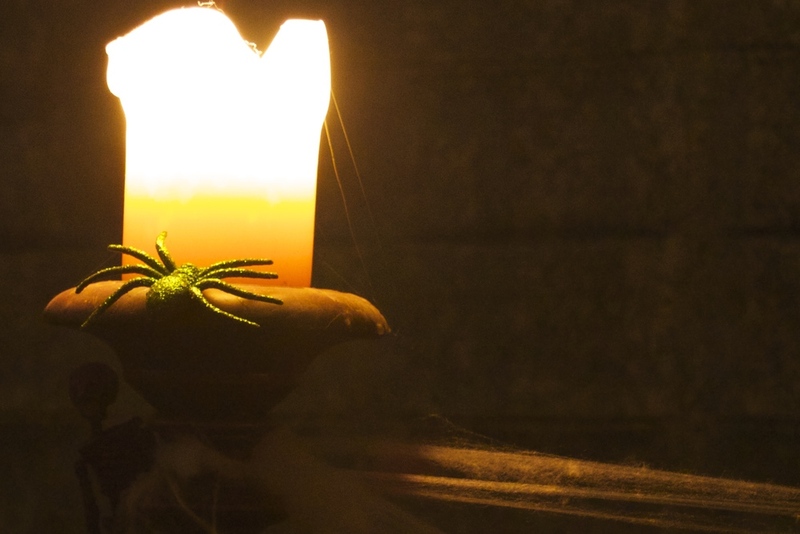 I used cobwebs to join the candlesticks and both candlesticks had a combination of spiders and skeletons crawling to the top. I positioned some skeletons outside the Graveyard with some spiders who were all trying to escape. While this party was wonderful in candlelight, it was very hard to capture the detail in photography, so at this point the lights are turned on to show some detail. At the front of the graveyard I had skeletons standing up on the graves and positioned to jump the fence. The graves and pathways were created using different coloured small stones. I loved the concept of the skeletons escaping the graveyard and the spiders leaving with them. It appears that some our our skeletons decided to stay for some adult fun rather than leave the graveyard. I used a number of different skeleton poses to add interest to the table. I dissected a number of skeletons and used the bones, I also used the bones from Halloween necklaces and bracelets. 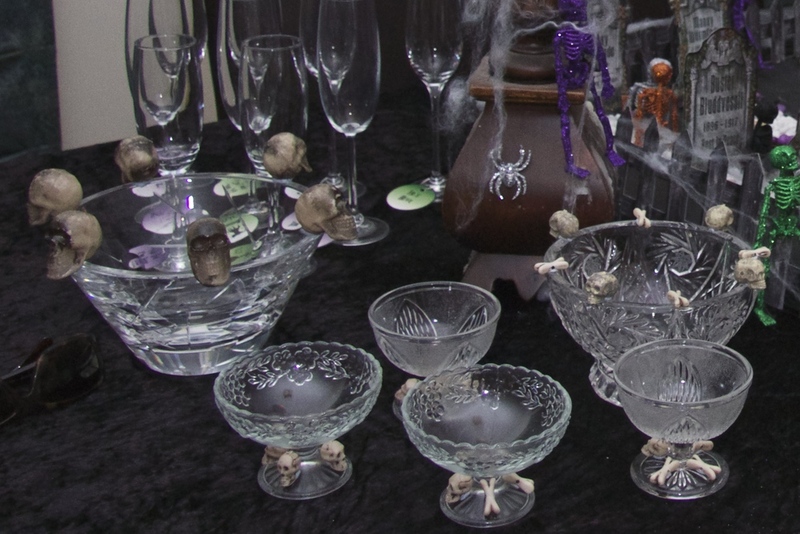 For this party I wanted the dishs to hide in the background, so I used vintage glass and crystal bowls and decorated them with different bones and skulls, mostly from Halloween jewelerry which was dissected for the occasion. I used small amounts of Blu Tack to hold the bones in place and this worked really well. 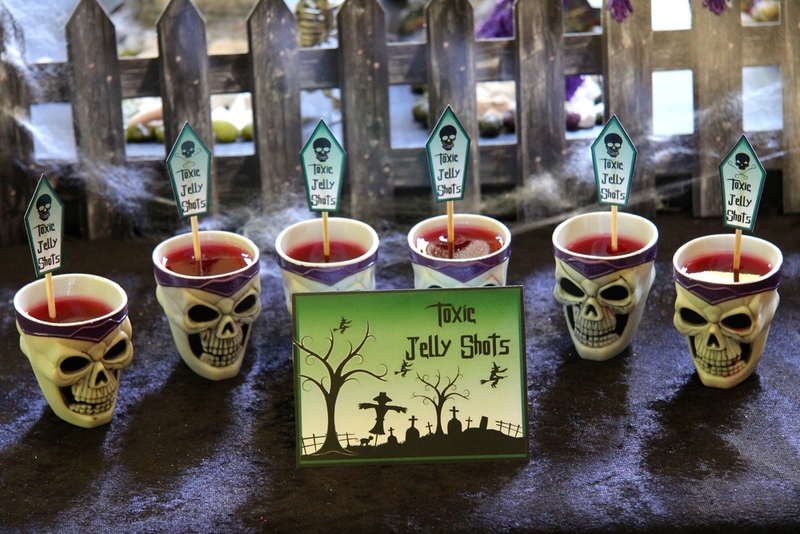 Hard to go past Vodka Jelly Shots for Halloween. These printables looked great to add some colour and are free to download. We only required simple catering with this party, some lovely cheese and biscuits with printables were perfect. Try standing some tall bread sticks amount smaller crackers. A simple bowl of Olives with Skull decorations always comes in handy. 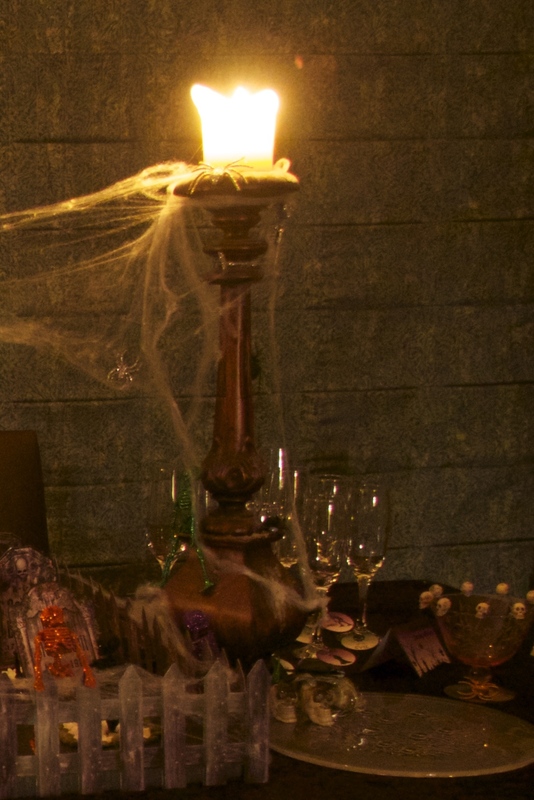 If you are looking for a totally different way of entertaining your guests then step back 160 years to the Victorian Gothic Period and entertain with a flamboyant gothic table setting, a gothic inspired menu, gothic party games with prizes and some good classical music. 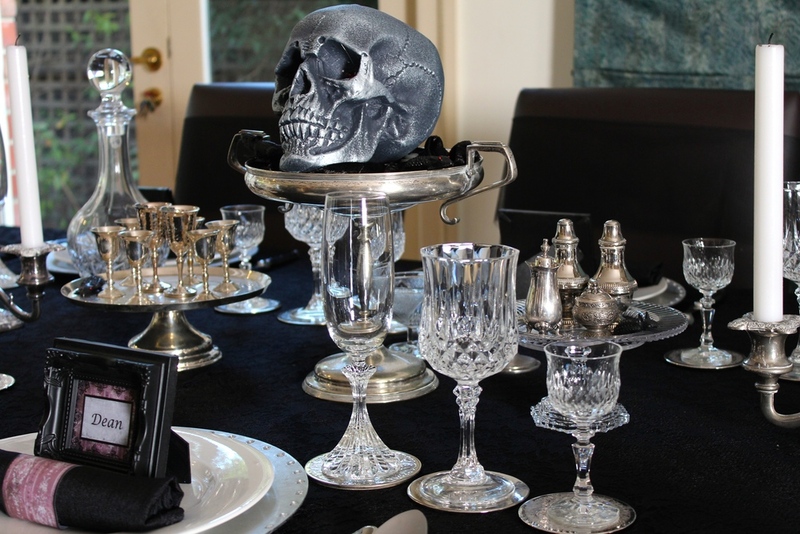 To recreate the 1850's I used a lot of silver and crystal pieces for this party. While I had or borrowed many pieces I managed to find a lot of wonderful vintage silver and crystal at both thrift and vintage stores. This was a real party, all meals and menus are included within this post. 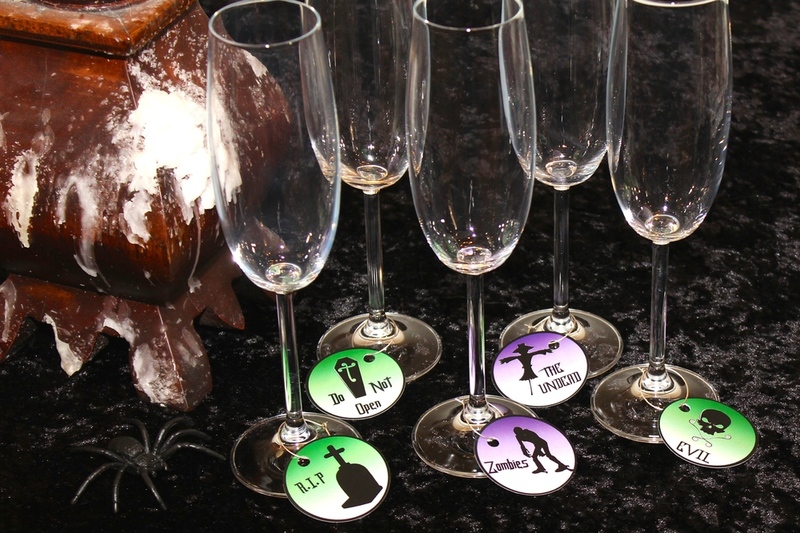 To really set the gothic theme I created a series of Gothic Party Games which are featured in this post and some core printables which added colour to the black, silver and white theme. The Gothic Party Games and Printables will soon be available from our on-line shop. 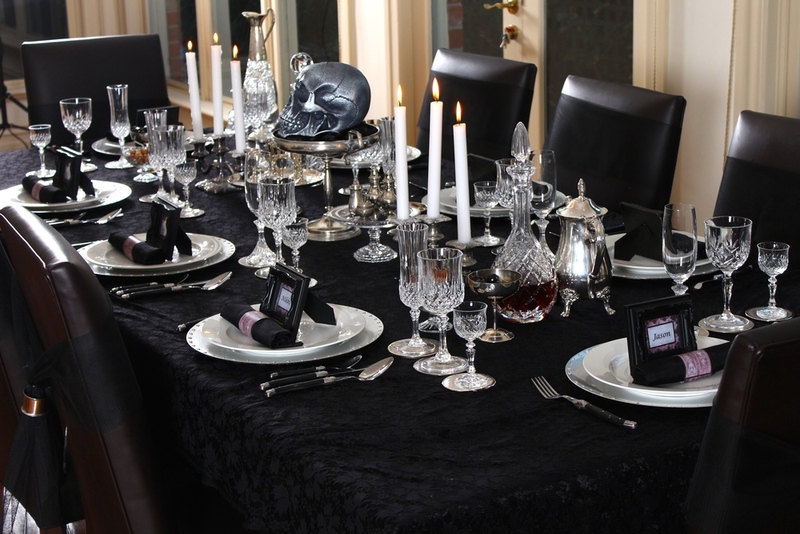 While this was a dinner party, it would work really well as a Gothic Wedding. This was a real party for eight, everyone arrived dressed beautifully in vintage styled attire to enjoy an evening of decadence and frivolity. 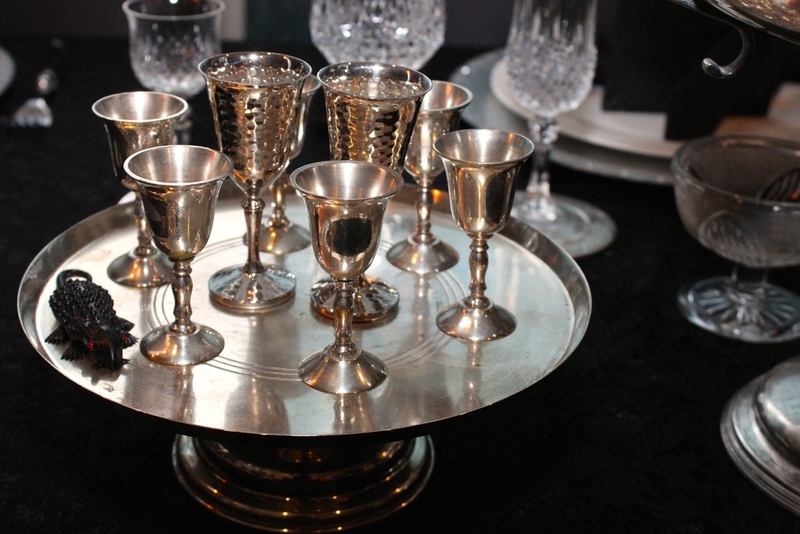 I used tiny pedestal silver goblets that were placed then on a larger silver pedestal tray for height. They were used for a very Victorian Sherry during the evening. Vintage silver salt, pepper and mustard looked great on a pedestal crystal dish. To fit the period I used crystal glasses for this party and complimented with crystal and silver decanters. The Chairs were wrapped with Tulle and a vintage silver napkin ring secured the tulle in place. 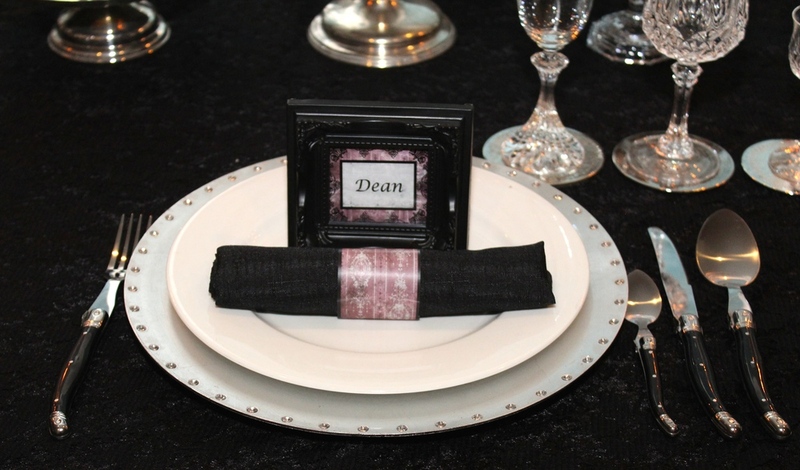 I used small vintage style black photo frames for name place holders, and embellished basic silver charges with press on crystals. For this occasion I did use my Black Laguiole flatware which was just perfect for this party. The Name Place Holders and Napkin rings will shortly be available from our on-line shop. They provided some vital colour to a very Black and Silver evening. I used silver coasters under all the glassware, these were easy to find in vintage stores. I styled a side board with pieces appropriate to the period, this included a selection of books available in 1850s and Vintage Globe book ends. I did include a small number of Halloween pieces but only included what could pass as taxidermy or sculptures. I displayed the menu on the sideboard and used the same style frame as the place holders. After much internal debate I settled on a menu of "normal" dish's made to look gothic, I included lots of red dishes and different shapes but everything was very edible. The menu will soon be available for sale in our store. For starters (selection of holy relics) I included four courses that were served as tasting plates. The first starter was a wonderful Oyster Shooter served in a crystal sherry glass with a small rat. 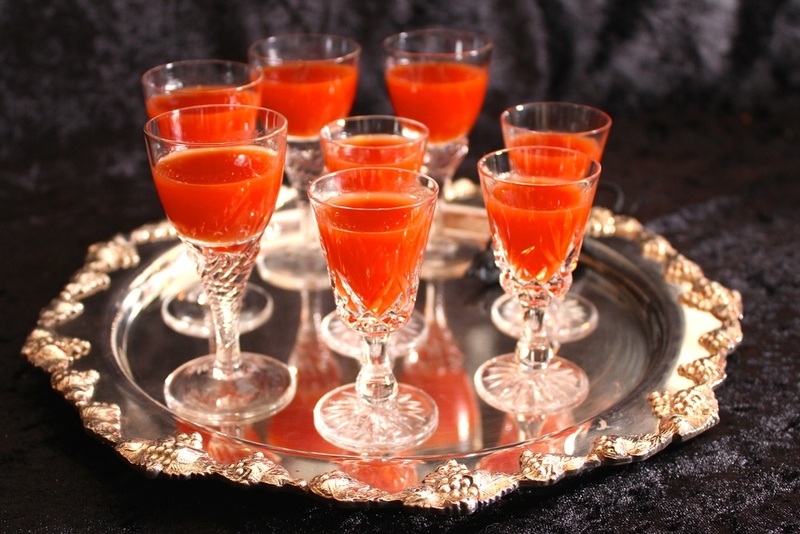 The next starter was a petite bloody Mary served in petite stemmed glasses and served on a vintage silver tray. Our third starter was Prawn with green olive aioli. 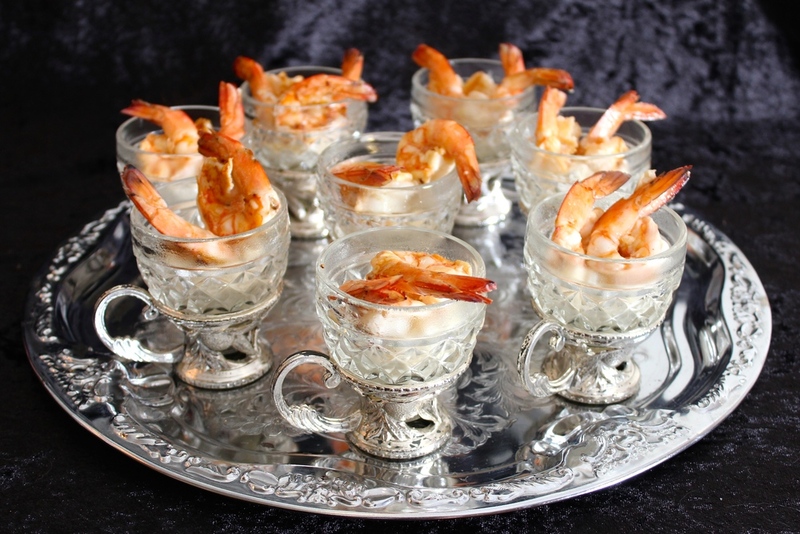 These were served in a small cut glass and silver cup on a silver serving tray. The final starter was a simple Bacon and Tomato on Toast, the toast was cut into a crucifix using a cookie cutter. 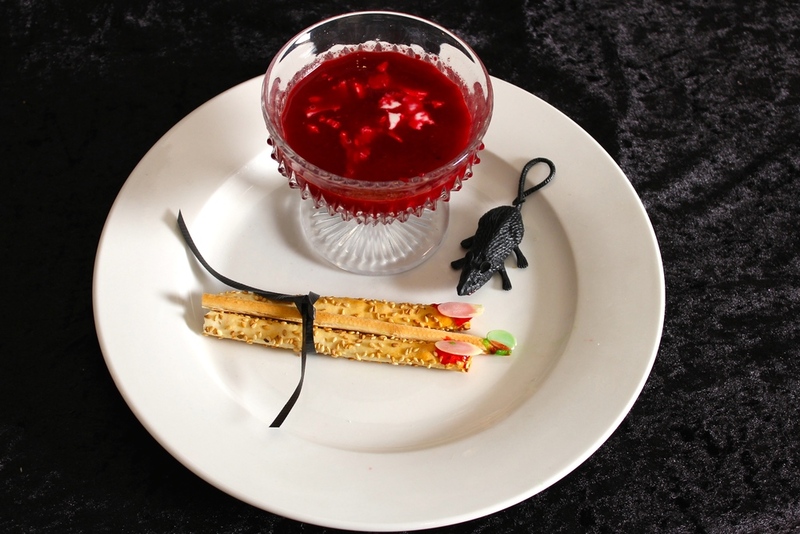 We included a soup course (Broth of sewer Rat served with dead mens' fingers). This was a warm Borscht served with Italian Bread sticks with almond sliver finger nails. All good Victorian Parties included a palette cleanser. I settled on a dark red Cherry Sorbet, these were served in vintage silver goblets with vintage collectable tea spoons. The main meal (Rack of suckling Wolf served with Brains and Veins) consisted of a herb crusted rack of Lamb with root vegetables cut into crucifixes. The Brains were provided via a Cauliflower Smash made in a plastic brain mould and the veins were simple green beans with garlic and butter. 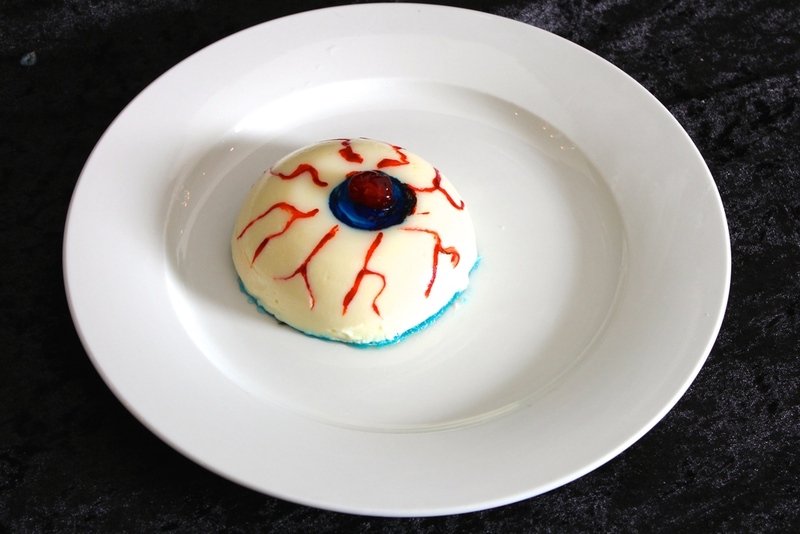 Both the Ladies and Gentlemen received a different dessert of Panna Cotta (Breast of Troll and Eye of Ogre). I used red and blue jelly as the base of the Panna Cotta and food dye as paint. Final touches included some well placed jewellery. 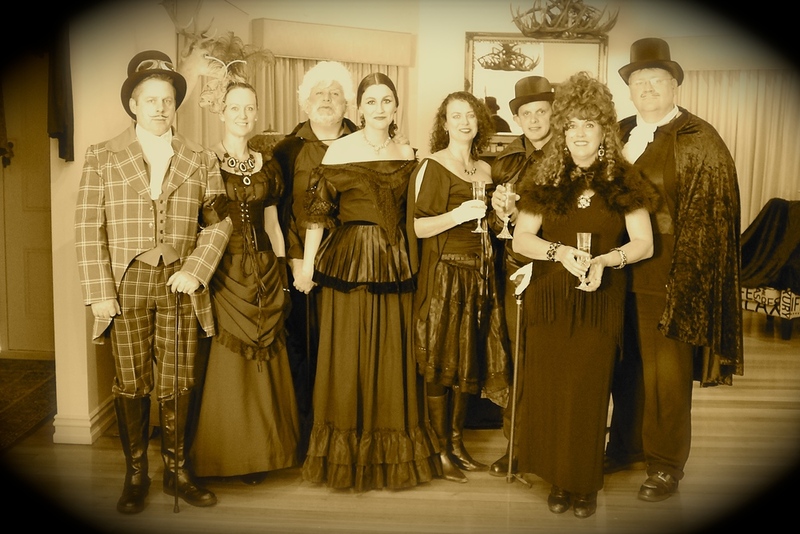 Each Couple was allocated a famous couple of the 1850 and part of the night was spent in Character. Various "guess who" games based on household objects from the 1850s or occupations from the 1850s. 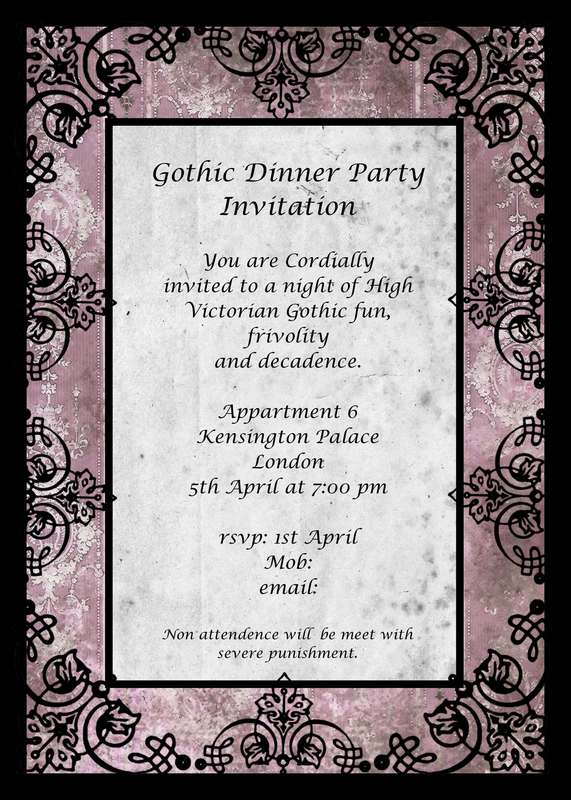 The party games, including full invitation instructions have been produced as a Gothic Game Package which will soon be available from our shop. For this Party I played Queen Victoria and proudly wore my tiara while in character. I created a number of prizes for guests including the best Poetry Recital. The invitations were delivered a few weeks in advance, I used my youngest child dressed as a Royal Messenger to deliver the invitation and details for the Games. And yes, this was a real party and my guests all went to so much trouble to source wonderful custumes for the evening. They all looked absolutely splendid. I created a relaxed Victorian drawing room to serve starters and Cheese before the main affair commenced. 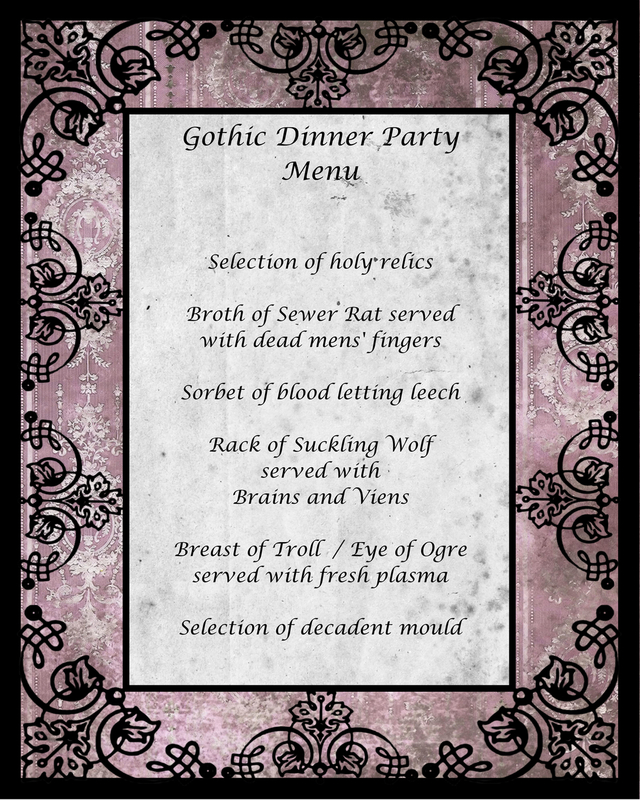 For this Gothic Dinner Party I opted for a menu I knew people would like and served it in a way to look "gothic". I included a lot of red dishes and used shapes to depict a gothic scene. Some of these ingredients will not be available at your local supermarket, try asian food stores and shop well in advance of the party. The Shooter liquid must be made two to three days in advance. 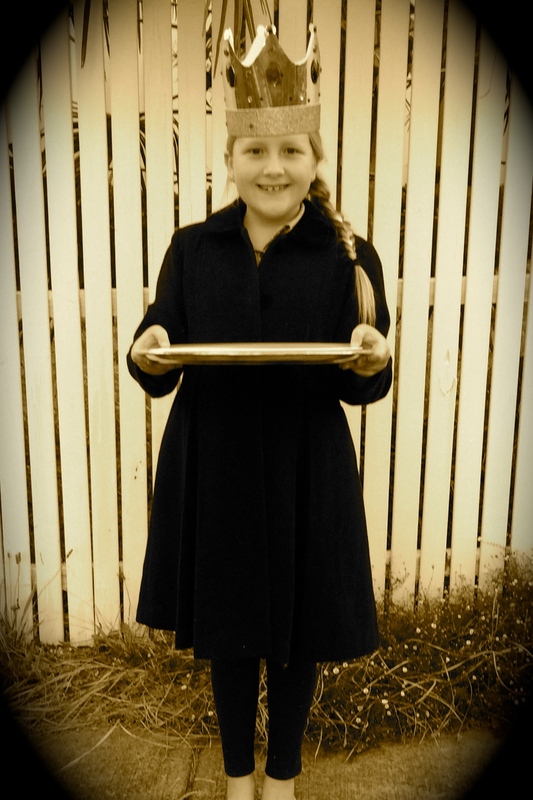 Have all serving ware close at hand and ready to use. Place the miring and sake in a small saucepan and bring to the boil. Once boiling light a match and burn off the alcohol (be careful). Set aside and allow to cool. Once cool transfer to a glass jug. Add the rice wine, soy sauce and wasabi powder. Stir until the wasabi has completely dissolved. The Oyster should float, if required use a small spoon to bring the Oyster to the surface. Place a small amount of Wasabi on each Oyster. Mix all ingredients together and store in a sealed bottle in the fridge. Place the prawns, garlic, lemon juice, salt and pepper in a bowl and toss to coat. Allow to marinate for 5 - 10 minutes. Finely chop the onion and fry in the remaining oil until soft. Grate the beetroot and add to the onion mixture with the stock and bring to the boil, season and boil for 8 - 10 minutes or until the beetroot is tender. Stir in the tomato, and transfer to a blender to process until completely smooth. Tie 3 Fingers together using black ribbon. Reheat the borscht and divide between pedestal crystal bowls (I used the bowls traditionally used for Ice Cream). Place the Borscht, Italian Bread and a rat on a plate to serve. Place all ingredients in a food processor and blend until the mixture is smooth. Remove from the freezer about 1 hour before required, as it starts to melt stir the mixture. If it melts to fast, return to the freezer. Peel the Potatoes, Beetroot and pumpkin. Slice approximately 1.5 cm wide and using a cross cookie cutter cut cross shapes from all three vegetables. *I used a larger cross for the Potato and a smaller cross for the beetroot and pumpkin. Make sure you buy potatoes that are large enough for your cookie cuter. Toss the vegetables in olive oil and sea salt and bake for 50 minutes, turning once. Season the Lamb and seal in a hot frying pan with the Olive Oil until golden brown. Transfer to the oven for 10 to 15 minutes, then allow to rest for 10 minutes. Tear the Bread into pieces (remove crusts) and place in a food procession. Brush the lamb with the english mustard and cover with the herb crust. Return to the oven for 5 minutes. I used small Chinese rice bowls for the eyes, they provided a rounded shape rather than a flat top. I also use a product called Sprink from Bakels as a release agent, this is great for releasing items from moulds and does not have any taste or colour. I made 10 deserts to allow a couple of spares. Combine the cream, milk, chocolate and sugar in a large saucepan over a low heat. Add the gelatine to warm water and wait for it to dissolve, then add to the cream mixture. Place a small blunt knife at the edge of the panna cotta and gently tip onto the plate. place a small amount of blue food colour on a saucer and using a round cookie cutter coat the base of the cookie cutter in the food colour, place the cookie cutter in the centre of the panna cotta, this will provide a true circle for you to work with. We recently attended a fantastic school fundraising event called Bogan Bingo. Bogan Bingo is a night to dust off your '80s bogan clothes (or make a quick trip to an Op Shop), dance to some fab retro music, play Bingo, partake in air guitar, ping pong competitions and watch the all important crowning of the nights king and queen Bogan. This was a really great night, we had a lot of Shazza's and Dazza's, Mullets, Ugg boots and visible underwear - a very classy event. The event had self catering so we all got to test our bogan cooking skills. After much thought and research I decided on a few dishes to grace our bogan table. Starting at Dessert, any self respecting bogan could not resist a can of VB. 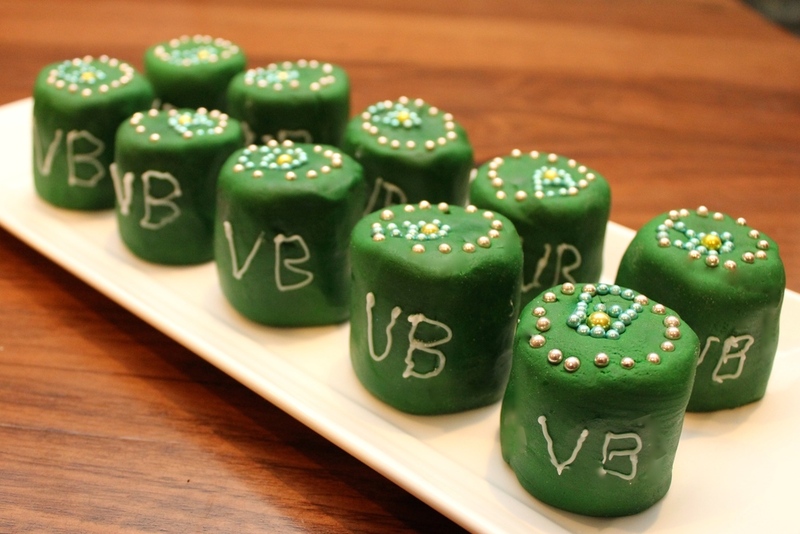 My VB cans were actually Chocolate Rum Ball mixture formed into the shape of beer cans. I then used green fondant to cover the Rum Ball mixture added a VB with some white icing and used cachous balls to make the rim and ring pulls. Another choice dish was good old cheese, Kabana and Savoy biscuits. I had a retro pressed bamboo bowl for serving and some classy umbrella's to decorate. One of my favourite dishes was bogan canapés. 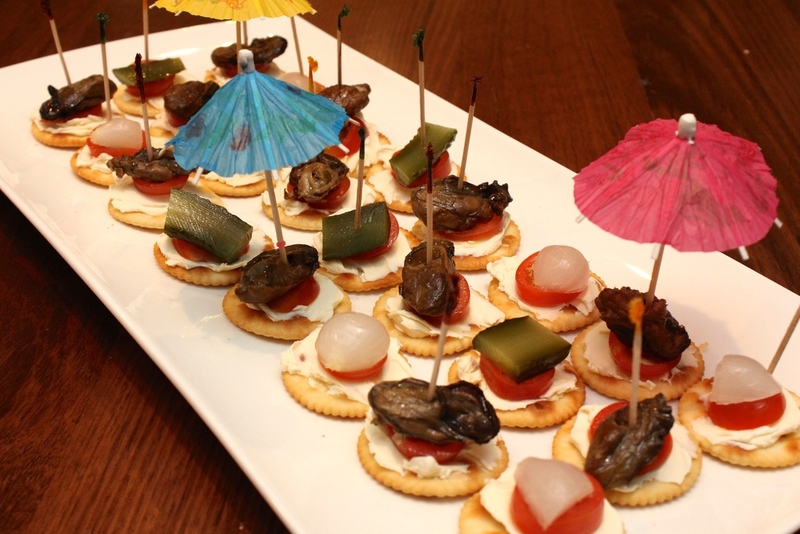 I used savoy biscuits and topped with cream cheese and slices of cherry tomato, I then added smoked oysters, cocktail pickle onions or slices of gherkin. Topped with more umbrella's you have another classy dish. 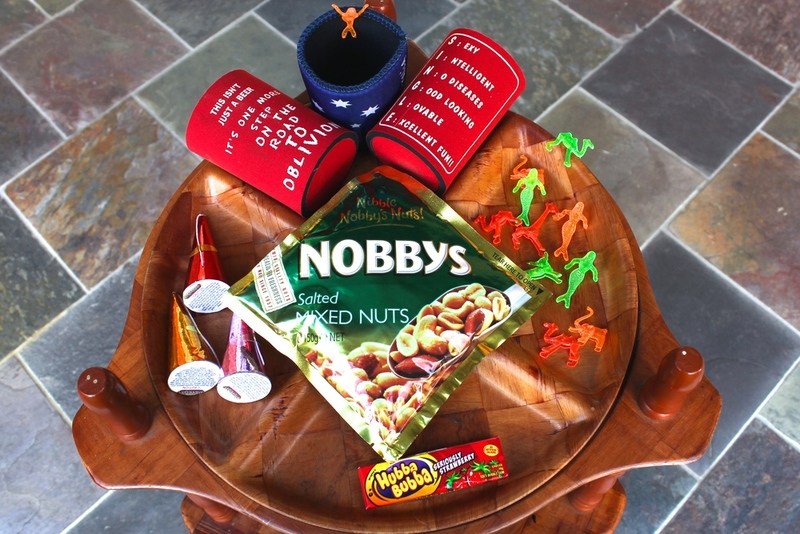 For some added extras for your bogan table try Nobby's nuts, classy stubby holders, plastic cockail glass animals, party poppers and a good bubble gum. Remember to use classy serving bowls, you can easily collect retro wooden bowls at most op shops. If you do get a chance to get to one of these nights, they are really a lot of fun, so dust of your dancing shoes and find your inner Bogan.